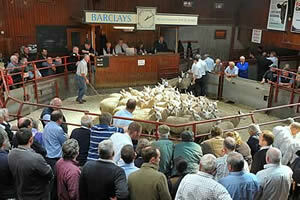 The Cumberland & Dumfriesshire Farmers Mart had forward 1,202 store lambs at their sale at Longtown on Tuesday 7th December, 2010. All classes of stores were the dearest trade of the season with a large company of buyers present. Top price of £73 for Beltex’s from Glendearg; Texel £72.80 Old Irvine, £70 Arnmannoch, £69 Mossburnford; Charollais £70 Cottage Farm; Hill Cheviot £65.50 Bradley, £60 Glendearg; Greyface £61 Devonport Farms; Blackface £55 Drummuckloch, £51.50 Cossar Hill; Herdwick £50 Thirlspot; Swaledale £33.50 Cottage Farm. Cast ewes to £64 Rinnion Hills.